Here is how to do home made murugal dosa batter recipe. Usually, I just use my idli batter recipe for making dosa. But if you are looking for making a really crispy dosa, then this is the recipe you need to be making. It is an extremely easy recipe and comes out good every single time. Hope you enjoy our video instructions! The recipe is very similar to the idli batter recipe but the easiest. All the ingredients are soaked together and ground. The batter needs to be ground to a fine paste and allowed to ferment for at least 12 hours. The dosa will nicely brown only when its fermented well. Also the batter consistency should be a little thinner than the idli batter consistency. After fermenting, if you feel that the batter is thick or your dosas or not coming out well, try to add little water and dilute the batter. But add very little at a time. If there is one dosa pan that is really worth it, then its gotta be the Lodge cast iron Dosa Griddle. I love it very much and have had it for more than a decade now. Its a cast iron skillet and cast iron dosa pan is the only way to go. The dosa pan you see in the video is a Lodge Iron Dosa Pan. I highly recommend it. UPDATE: Recently, Indian made high quality pre-seasoned cast iron pan has been introduced in the market and I am super happy to say that the manufacturer is none other than my school buddy Santosh Leelakrishnan. The cast iron tawa is proudly made in India and very reasonably priced. If you have old cast iron dosa pans at home, you can season them and bring life to those pans back. You can see how to season a dosa pan properly HERE. 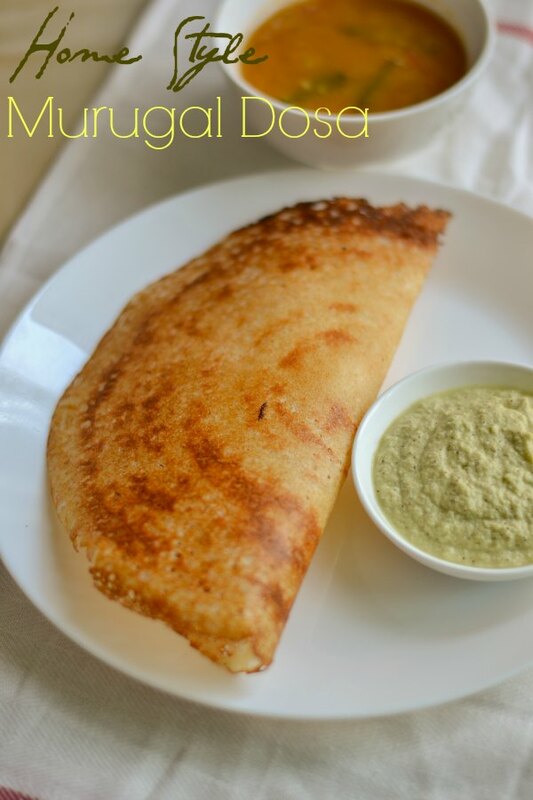 Recipe for home made murugal dosai with batter made from scratch. Dosai batter recipe. Home style ghee roast. A video recipe. Wash the rice and dal in running water 2-3 times. Soak all the ingredients except the salt together in water for at-least 4 hours. Grind the ingredients with little water to a very fine paste. Add upto 2 cups of water while grinding. If you are grinding in a mixie, take time and grind in 2-3 batches. Try not to add a lot of water while grinding. Add in the salt to the batter and mix well to combine. Cover the bowl and allow it to ferment for at-least 12 hours in a warm place. The batter would have almost doubled in volume after the 12 hour fermentation. Mix the batter well and the dosa batter is ready. Store the batter in the refrigerator for up to 3 days and use as required. If the dosa batter is very thick, thin it out by adding very little water. Heat the dosa griddle until medium hot. Add ⅓ cup batter and swirl to completely cover dosa griddle. Sprinkle ¼ teaspoon of oil or ghee to the dosa. Cook until underside of the dosa is golden brown, about a minute. Loosen the edges of the dosa with a steel spatula. No need to flip the dosa. Remove dosa from the griddle and repeat with remaining batter. Adding oil to the pan and then doing dosa will make it difficult to spread the batter. Always add oil to the dosa and not to the pan. This appears to be an easier and simpler recipe. Like instant dosa. Do you think it would be as tastier as the traditional on where the urad dal and rice are soaked and ground separately in a wet grinder? Please watch the video / READ the recipe again. This is not an instant dosa. The batter is very much fermented. Dear Suguna, just wanted to clarify if the whole white urad dal is to be used for this recipe. I used split white urad dal the previous time. The ingredients mentioned only says Urad Dal. Many thanks. Yes Sharon. Whole white urad is preferred. Thank you Suguna for the prompt reply. Dear Suguna, I am planning on trying the crispy dosa recipe once again. Just wanted to clarify which urad dal is to be used. The whole white or split white one. Last time I used the split white urad dal. Many thanks. I tried your recipe and it was the best dosa batter that we ever made. It was lovely. However, I just wanted to clarify one thing. It remains crisp for about a 1 minute or so after taking it off the pan. Post that it tends to soften. In the restaurants, the crispiness remains for a much longer time. Any idea on how to retain the crispiness for a longer while ?. We tried it with your onion/tomato chutney. Yum. Many thanks. cook at medium heat until it browns nicely and adding more oil/ghee will make it crisp and remain crisp for a longer time. Thank you for the reply. Will try this the next time I make the batter. Thanks! When to add the baking soda? There is no baking soda in this recipe. Traditionally, we never add soda to our idli and dosa. Which raw rice do we use for the dosage? Thank you so much Preeti. Really Glad. Your comments mean a lot to me. Thank you so much for this recipe. It came out so well.. i also tried your Chettinad kara chutney with this dosai. I am so happy with the results.. Thank you so much. Glad that you liked the recipe! Yes. you can soak everything together. With wat do i soak the tur Dal?? – you soak everything in water. Have never trained long grain rice for dosa. I tried to make dosa with the same measurement but it did not come out well.they were not at all crispy and we’re sticking on the Tavares.i was v excited but was disappointed. I did use parboiled rice and for raw rice I used regular white basmati rice and grinder it in wet grinder.pl tell me what did I not do correct. Hello Saguna I would like to know can we prepare Idly of this batter by soaking all together.? Thank u. If reply earliest. I use this recipe for both idli and dosa. Hi is it OK if I never use poha? You will need to use Poha. good such taws made in India are available with amazon. Lodge logic items are too costly . thanks for giving this information. next what about cast iron shallow vessesl (in tamil “illuppa chatty) for making vegetable roasts. I can proudly say that im a huge fan of all ur vegan recipes..i can confidently try any of urs..im really appreciating all ur efforts in bringing out the recipes from whichever corner its in. Im going to try this and will update u how it is..Do we really need to store the batter only for 3 days?cant we use it more than that? Thank you Sowmya. The batter still ferments in the refrigerator and the dosas will be sour after 3 days. You can consume but its gonna be sour. Thanks for the reply Suguna. BTW I tried the dosa today and its a huge huge hit!! Can i use sona masoori instead of raw rice? yes! you can use sona masuri! HI Kannama: Thank you for explaining the nuances of the otherwise quintessential dosa! I have a naive question so please pardon it- what is the difference between idli and ‘raw’ rice. I live overseas and we get Sona masoori which i presume is the Idli rice? Does ‘raw’ mean basmati rice? There is a very special personality to your blog and recipes just like your name 🙂 I have become a huge fan! Please refer to this post to know the difference about the rice varieties. I make idlis from your recipe and they come out excellent…. 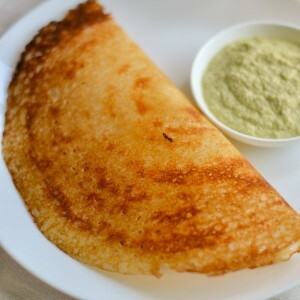 The same batter however doesn’t make really nice dosas… How do I know if my batter is perfectly fermented for dosas?.. I end up making it from rawa dosas..
For dosas, the batter needs to be little thinned out. Try next time with thinned out batter. Totally loved the crispness of these dosas…Thanks for sharing the recipe with that secret ingredient. Really glad that you got crispy dosas Preeti! Thanks Salima. Please refer our chutney sambar posts. Dear sugu sis…..vanakkam…missed your posts during vacation. Tried murugal dosa, dum tea, OPOS onion thokku.all turned out real good….thanks for the wonderful recipes.keep going machi? Thank you so much Andal! Welcome to the world of OPOS. Can we grind this in grinder? 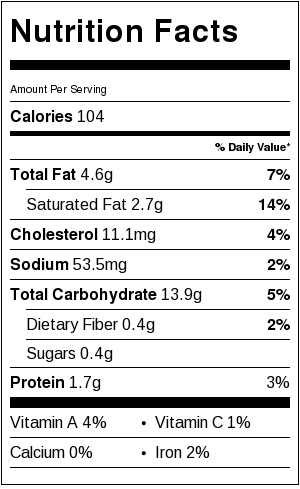 If so, should we grind the ingredients separately? Sure Sasha. You can grind in the grinder. You can grind seperately. I never thought that it would taste this good.Excellent!! !Thanks for sharing this recipe. Ever since I saw your video on Facebook, I am hooked to ur website.please keep making more videos like this. Your work is phenomenal ..I love the way u approach all the recipes explaining the science behind it. ..u are a Godsend for people with no mothers to guide .. Please do make more opos videos and more basics videos. Like how to make filter coffee, chapati dough, vada etc. Alsoo can we use this same batter for idli as well?? Thank you so much Aishwarya. Idlis are not bad in this batter but I prefer only dosa using this batter.